Quilt along with Leah and Sheri and make a beautiful quilt to celebrate the autumn season! 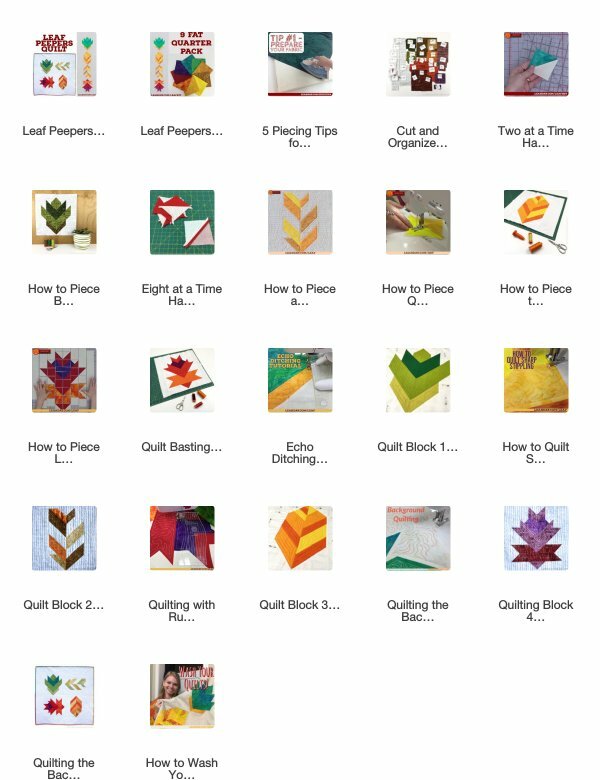 The Leaf Peepers Quilt Pattern is a guide to piecing four beautiful leaf quilt blocks and connecting them together to create either a 40-inch square wall hanging or a 24 x 74-inch table runner. The pattern includes lots of diagrams, tips and detailed instructions for not just piecing the quilt, but quilting it as well! Learn how to piece and quilt this beautiful fall themed quilt! Leah Day and Sheri Cilfaldi-Morrill shared step-by-step quilting tutorials for this project for you to follow along. What do you need to join the Leaf Peepers Quilt Along? Just pick up a copy of this quilt pattern! Download the Leaf Peepers Quilt Pattern today and gear up for the Quilt Along starting in August. Optional: Slice and Mini Slide Quilting Rulers for ruler quilting on your home machine. Find all 9 colors from Leah's Leaf Peepers Quilt in this set! Click Here to find this fat quarter bundle! This is PDF downloadable pattern which means you will be able to immediately download and print the instructions on your computer and start sewing today. Simply click the link after completing your order, or find it in your order confirmation email, to download your pattern and print out the pages on your home printer. Worried about downloading a pattern? Click Here to find tips on downloading files. Are the videos included inside the pattern? No, the quilting videos will be shared starting on August 13th and be posted every Monday until the quilt is complete. Click Here to find this Leaf Peepers fat quarter pack! Page 2 - The pattern reads: "W-HST2 - Used on blocks 2 and 3." Correction - W-HST2 - Used on blocks 2 and 4. Page 5 - The pattern reads: trim on all 4 marked lines and press seams open. Correction - Trim on all 8 marked lines and press seams open.